The Gospel of Inclusion, known by other names such as “inclusion,” “inclusivism,” “universalism,” “universal reconciliation,” or “ultimate reconciliation,” is nothing new in church history. Certain church fathers endorsed the view, and the early church ultimately took a turn in its theology where the fire of Hell was viewed as “purgatorial” or “transformative” in nature (out of which, the doctrines of Purgatory and Annihilation were born). 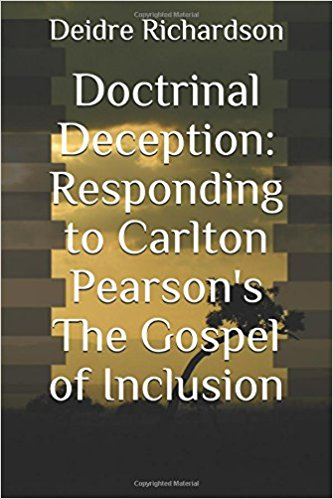 Richardson’s new book is part of a two-book series that seeks to provide a biblically faithful and theologically robust Christian response to Pearson’s decade-old book, The Gospel of Inclusion: Reaching Beyond Religious Fundamentalism to the True Love of God and Self. The fourth-generation, Classical Pentecostal preacher and Bishop has emerged again in the news in recent days due to a new biographical movie about him at Netflix titled “Come Sunday.” The movie arrived on Netflix last month. Though this is Richardson’s first book on the Gospel of Inclusion, The Essential Church Founder and Pastor is no stranger to the false doctrine. While attending seminary for her Master of Divinity degree in Christian Apologetics, she studied the doctrine under the Seminary’s Dean of the Faculty, Dr. Kenneth Keathley, author of Salvation and Sovereignty: A Molinist Approach. Keathley mentored Richardson in her subsequent post-graduate, Master of Theology degree, where she concentrated in the area of Theology of Religions while studying the historical Filioque Controversy. Book 1 of Doctrinal Deception is on sale at Amazon in both digital (Kindle) and paperback versions for $9.99 (Kindle) and $20 (paperback). Book 2 of Doctrinal Deception will arrive on Amazon next week. 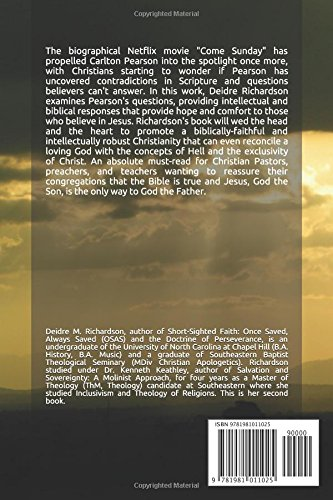 In it, Richardson answers deeper theological questions pertaining to the Doctrine of Reconciliation and whether or not the appropriation of the atonement is automatic. To pick up your copy of Doctrinal Deception, head on over to Amazon by way of the orange "Doctrinal Deception" link below.